Do winter pears ever make an appearance at your house during the holidays? A crinkly brown sack of full of Martin Sec pears always finds its way into our kitchen this time of year. A winter variety that has been common here in France since the 16th century, this type of pear is available through January. Small and matte golden yellow in color, they sometimes take on a pinkish hue on the shaded side of the fruit. These are always delicious cooked in syrup or wine. The intimate size and poetic form of this fruit is so perfect, however, you might also want to employ them as punctuation marks in a fruit or flower arrangement. We get the Bosc pear here which is lovely poached in a late harvest Reisling then sprinkled with blue cheese crumbles and candied toasted pecans. Happy Christmas Lucy! Pears poached in red wine and vanilla bean has been a standard Christmas dessert whenever we host. It was only replaced this year by Gingerbread Pudding ... tough call. Pears are somehow the most elegant and perfectly formed fruit. I love the taste and feel of pear juice running down my chin! Happy New Year Lucy. Hopefully this year, we will be able to connect in real life. I hope your little family is doing wonderfully. 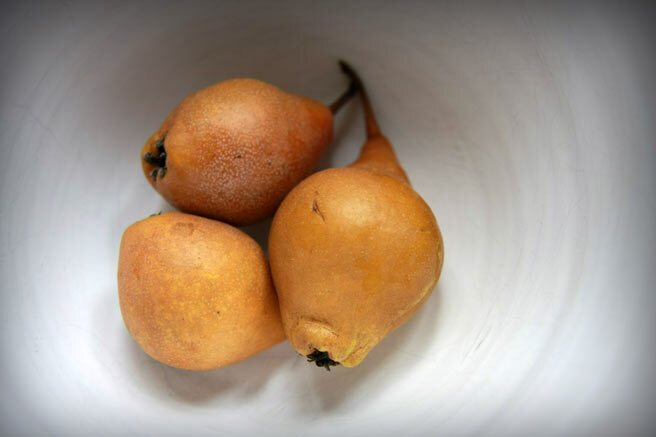 Husband loves little hard winter pears , simmered very slowly with cloves till they go pink . The kitchen smells gorgeous as they cook . Here in Holland they're eaten with meat , but they're lovely with a good , creamy rice pudding too .